Home › Sociology › gender & feminism › The Tenth Down Under Feminists Carnival is fast approaching – please submit your posts now. 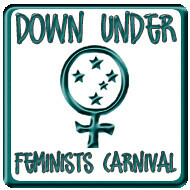 The Tenth Edition of the Down Under Feminists Carnival is fast approaching! The deadline for submissions is the end of the month, so get your posts in before midnight Saturday. This edition will be hosted by Queen of Thorns at Ideologically Impure. Submit your February posts, or those of others, by an Australian or New Zealander feminist at blogcarnival. If you can’t access the blogcarnival captcha, you can email submissions this month to qotblog at gmail dot com. The theme this month is “Fighting the power/Subverting the dominant paradigm“. The theme isn’t intended to be prescriptive – please submit any and every feminist piece, by yourself or by others. Or if you prefer, you can use the theme as a writing prompt – but be quick. Please spread the word about this carnival (including the links in this post) to your feminist blogging networks. And if you’re interested in hosting a future carnival, please contact Lauredhel. ‹ Thursday Cheezburger: Hoyden Kittehs!